I have very special memories with my grandparents. I would go and visit and stay overnight for a week at a time. And when I showed up and my mom left, my grandma would begin spoiling me. We would make chocolate chip cookies. She's have shrimp cocktail just for me. We would have tea parties. I would get to drink 7 Up out of a fancy glass. We would sit quietly and read together. We didn't do anything really exciting or go on great adventures. But we spent time together and I felt special and loved. When I was in elementary school, mom and I lived in an apartment. I remember a neighbor who lived next door - a single woman. I don't remember her name. I don't remember a lot of interaction with her. But I remember hanging out with her. My memory of her was that she was probably in her 30's and was a professional in an office. I felt like an adult when I hung out with her. I felt like she enjoyed my company. Shortly before she moved away, I remember she took me out to lunch. We went somewhere downtown and it was fancier than anywhere I'd ever been. She took me to a little gift shop and I picked out a stuffed animal - a unicorn. It wasn't my birthday but I felt loved and special. In 5th grade, my dad adopted me. The day of my adoption, we all went to the attorney's office. My parents went to the courthouse and I stayed with the attorney's wife in the office. Paperwork was signed and when they came back, my dad was mine. That alone is very special feeling, of course. But I remember my 5th grade teacher. She found a moment alone with me the day before my adoption day. She told me that being adopted was a big deal and that my dad must love me very much. She wanted me to know that she was very excited for me. She didn't say it - but she wanted me to know that she loved me. She gave me a small gift to celebrate the occassion. It was a little porcelain figure of a little girl. Again - I felt special and loved. I share each of these stories to show that simple acts of kindness can have a big impact on a person. We have lived in our home for almost 13 years. We live on a street where people stay - we don't see a lot of moves in and out. My kids have recently made friends with an older couple (I'll just call them Mr. and Mrs.) who have lived across the street for 22 years. My kids adore this older couple. Mrs. will be 77 next week. Mr. is probably a couple of years older. They take good care of each other and of their home and their neighbors. My kids love to go visit Mr. and Mrs. In fact, my kids have adopted them as grandparents - and been adopted as grandkids by this couple. On Saturday, Teagan said she wanted to do something for them , to show them that they are special. So we bought flowers and the kids wrote a nice card and we took it over to them that evening. Teagan and I sat and visited with them for a little bit. And I instantly understood why my kids wanted to be around Mr. and Mrs. This is their next door neighbor, their 5th grade teacher, their special week with grandma. They feel loved and special. Mr. and Mrs. don't see the pouty side or the angry side. They see and they express and they adore the pleasant and polite and loving side that my kids show to them. My kids, Teagan especially, gets a big dose of love and some affection when she spends time with Mr. and Mrs. She hears about how wonderful she is, she helps them out around the house, she learns about cleaning and gardening and mowing. She laughs at silly tricks - like Mr. "pulling off his finger." Right across the street, my kids can look out their window and see a place where they feel spoiled, loved, special, cared about, happy, content - in a unique way that we can't offer in our own home where we have to have rules and expectations and chores and homework and sometimes fights and places to go and things to get done. Do you have a place where you've felt special and loved? A memory you hold dear or a place you slip away to when you need a little extra loving attention? Yesterday evening, we went to the 4th grade track meet. It was a gathering of 4 Elementary schools. The kids have been practicing and learning for about 6 weeks and for most, this was the first time they'd done this sort of sport and gone to this sort of event. It was very exciting and the environment was fun and supportive. I was a fool for encouragement. I stood by the fence and cheered my head of for all the kids. Especially the ones in the middle of the pack and even more for the ones at the end. I recognized the look on some of those little faces - because I've felt that same feeling of hating what I was doing, not enjoying being so slow, but trying to just get to that dang finish line. I cheered my head off for those kids. But what has stayed with me and what has brought me to tears every time I tell the story is one little boy from another school. He was smaller than everyone. He appeared to have some sort of mild developmental delay - you could see it in his gait, in how he held his head. He ran the 800 (2 times around the track) and he came in last - well behind the pack. But he never gave up. He kept going. Plugging along. He ran a leg of a relay race. I happened to be at the fence right where his hand off partner was. This little boy comes plugging down the last 60 yards. The next runner is waiting patiently. Waiting. I'm Sorry. I'm so sorry. I'm sorry. My heart broke open. A giant lump in my throat. I cleared that lump and cheered loudly for him. What broke my heart was that he knew that his very best effort wasn't good enough. He knew that he wasn't as fast or as coordinated as his teammates. He knew that he was holding back his team. When there is an individual event, finishing last is just on your own shoulders. You can take prid ein knowing you did your best, you crossed the finish line. But to try your best, work your hardest, and still not feel like you're enough for everyone else. No one should ever feel like they have to apologize for who they are. We've all felt that, though, haven't we? We see our shortcomings and we know how they impact others and we feel less than, we feel like we have no value, we degrade ourselves pretty harshly sometimes. And that's exactly why it's so important to be kind and loving to everyone you meet. 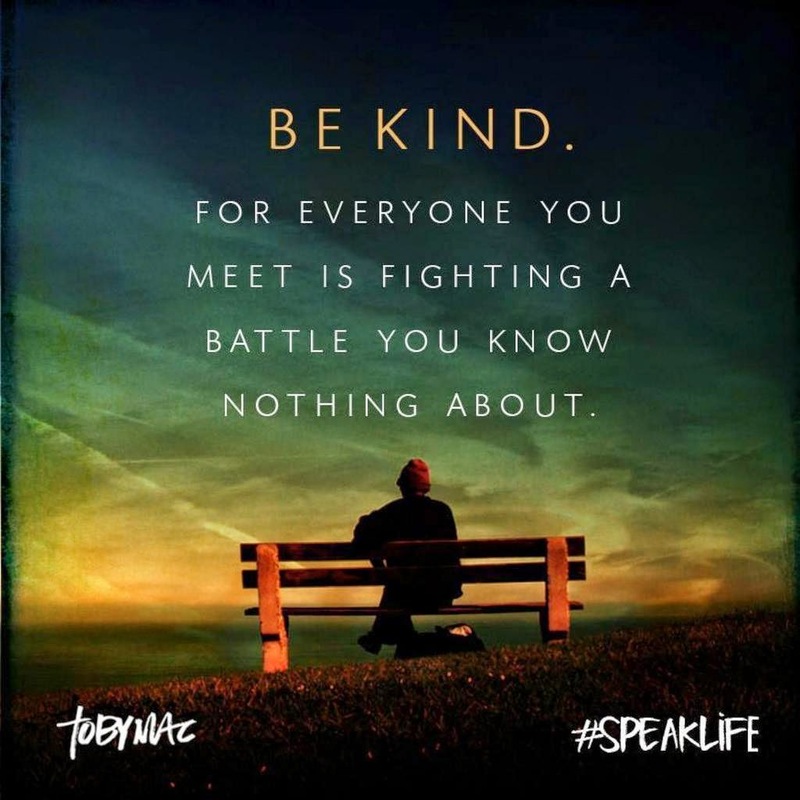 Whether it's a shortcoming we can see or it's a difficult situation in someone's life or it's an internal struggle.... we all have things happening that need kindness from others. That need gentleness. That need love. Some are grieving, some battle mental illness, some are struggling in their parriages, some are watching their children fail, some hate themselves, some feel worthless, some are addicted, some are poor. We are all living with hurts - and the kindness of those around us is what can keep us going. When you get to the finish line or when you get to your relay teammate, don't apologize. Do the best you can on the journey. If we're living in a world where kindness is the expected response, that last place finish or slow relay hand off would be celebrated and not ever cause for apologies. Be kind. Encourage others. Cheer for everyone you meet. Share laughter and smile and joy. Dance like a fool. Hug people. Hold hands. Make the world a loving place. Make the finish line a place of celebration. I love it when God leads me through the Bible - even if the path gets a little crazy! I've been receiving messages through Scripture and prayer and music that I need to spend time being still, being quiet, listening. I'm working on making that happen. I recently decided to take a verse that spoke to me and do something called "verse chaining." The idea is tha tyou pick a word that stands out to you in the verse. Do a keyword search on a Bible website or app. See what other verses come up that might have that word in them. 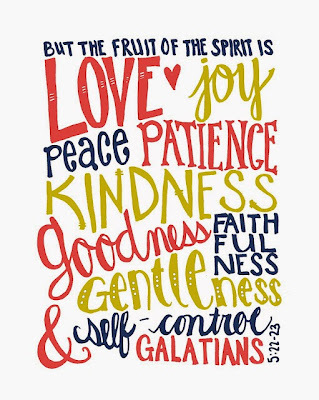 Do any of those verses speak to you? I sat down with Exodus 14: 13-15. But Moses told the people, “Don’t be afraid. Just stand still and watch the Lord rescue you today. The Egyptians you see today will never be seen again.14 The Lord himself will fight for you. Just stay calm. This leads directly into Moses parting the Red Sea. Don't be afraid. Stand still. Stay calm. God will fight for me. So I looked up the words "be still." And it led me to Matthew 14. Jesus has learned that John was killed. He wants to be alone but a crowd follows him, he has compassion and stays among them and heals people. Then comes the feeding of the 5000 - the miracle of the loaves and fish feeding the large crowd. The crowd disperses and Jesus goes on top of a mountain to be alone and pray. The Disciples head out on the fishing boat. "Be still. It is I. You have nothing to fear." Following Jesus, having faith, means abandoning fear. Normally I would then pick out a word that spoke to me in what I'd just read. But I wanted to just move on to Matthew 15. This time, verses 16-20 stood out to me. Those tricky Pharisees and religious teachers are trying to corner Jesus and get him in trouble about following old laws. But Jesus tells them that following those old rituals isn't what matters. It's what's in your heart that matters. "16 Do you still not see? 17 Don’t you understand that whatever you take in through your mouth makes its way to your stomach and eventually out of the bowels of your body? 18 But the things that come out of your mouth—your curses, your fears, your denunciations—these come from your heart, and it is the stirrings of your heart that can make you unclean. 19 For your heart harbors evil thoughts—fantasies of murder, adultery, and whoring; fantasies of stealing, lying, and slandering. 20 These make you unclean—not eating with a hand you’ve not ritually purified with a splash of water and a prayer." This reminded me of Matthew 22:36-40. The Pharisees are again trying to corner Jesus and make him look bad. But he, of course, turns the tables. And he gives a new law - one that covers everything. One that, when followed, makes all the Commandments fall into place. "Pharisees: 36 Teacher, of all the laws, which commandment is the greatest? Jesus (quoting Scripture): 37 “Love the Eternal One your God with all your heart and all your soul and all your mind.”[a] 38 This is the first and greatest commandment. 39 And the second is nearly as important, “Love your neighbor as yourself.”[b] 40 The rest of the law, and all the teachings of the prophets, are but variations on these themes." "30 You should love the Eternal, your God, with all your heart, with all your soul, with all your mind, and with all your strength.”[f] 31 The second great commandmentis this: “Love others in the same way you love yourself.”[g] There are no commandments more important than these." So what is in your heart will come out of your mouth. If your heart is filled with God's love, love will come from your mouth. Love will come from you. But what exactly is love? Because it seems like there are a lot of people with a lot of ideas on how to love someone. We love by being affectionate. We love by taking care of others. We love by feeding the poor. We love by being kind. We love with "tough love." We love but it's clouded by judgement. We love everyone but we make rules about how someone receives God's grace or finds salvation. 1 Corinthians 13 makes it very clear. 13 Three things will last forever—faith, hope, and love—and the greatest of these is love." My actions may look like I love others. Maybe I feed the poor, take care of the single mom or the widow, maybe I save orphans and clean up from hurricanes, maybe I take in foster kids, maybe I'm doing the things God calls me to do... but if I don't have love in my heart, those actions are meaningless. How do we know if we are loving someone? This is often used at weddings as a "between husband and wife" type of Scripture reading. But it's more than that. This is how love should look to anyone. This is how we should love our friends and family, how we should love the people next door, how we should love murderers and adulterers, how we should love people who look different than us or believe different than us. Someone should know I love them because they experience patience, kindness, humility, compromise, forgiveness, joy, and perseverence. 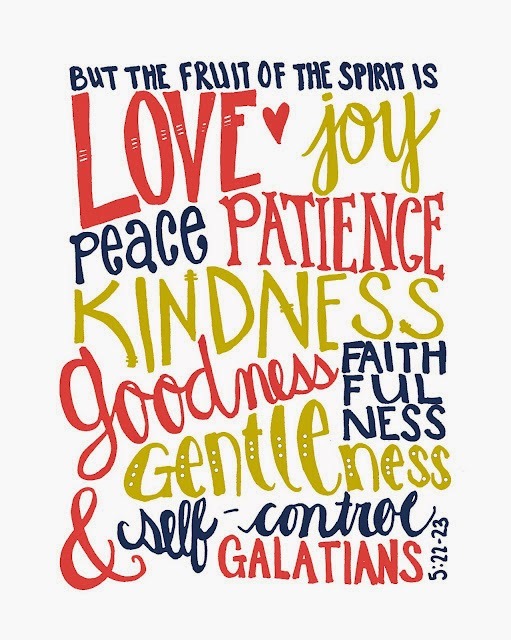 Which sounds a lot like the fruits of the spirit from Galatians 5:22-23. I started out needing to be still, knowing that God will fight for me, knowing I can then move on. Realizing that God gave that message in the Old Testament to Moses and Jesus gave it again to the Disciples. When I am still and I am faithfully following Christ, I take time to dive further into His word, to hear His calling for me. And that led me to studying what God says about love. About the condition of the heart. About how another person should experience Christ's love from my heart and out of my mouth. There are time that I am overwhelmed by God's love and I can't help but share it. Those are the easy times. And there are times when my daughter is being a snot and my response to her is definitely lacking patience and kindness - lacking love. I think that anyone who gets really honest with themselves can see where they've pushed God away from their heart - where they need to do a better job of loving. You can just feel it on the inside. You can put on an act, you can convince yourself and others that your choices are for the sake of improving this or building that. But on the inside, I know when I'm lacking love. I know when my choices feel wrong. I know where I need to love better. It starts with being still. It ends with loving better. Need Some Motivation? Meet Erin! I've really really really been struggling with motivation lately. I've had days at work where I don't actually complete anything. My house is a disaster and I have no interest in cleaning it up. I don't want to be active or make healthy choices. I want to want to do these things. I want to be an effective employee with a strong reputation for following through and getting things done. I want to have a home that I can invite people into at any time. I want to feel good about my choices in how I take care of myself each day. I've identified that my big issue is motivation. I want the result but am struggling to find the desire to do the work. And I'm reminded that if I think back on it, the work is all work that I even enjoy while I'm doing it. I like to ride my bike or go for a walk. I like to be productive and work through spreadsheets. I even like cleaning. 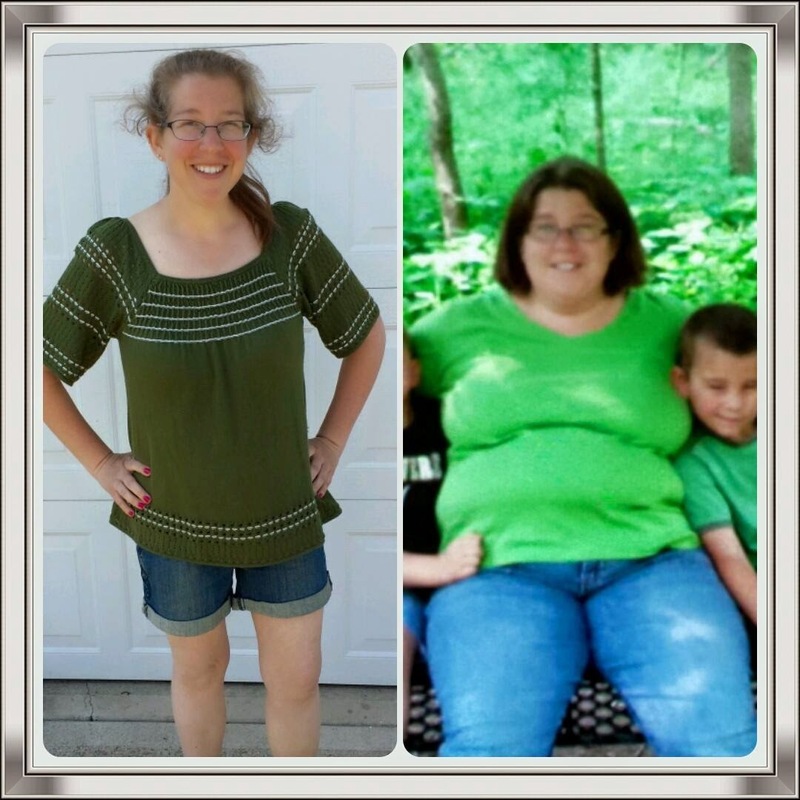 My friend, Erin, recently had an amazing success with finding and keeping motivation to make changes in her life. I asked if I could share her story - because her story was shining a tiny little ray of motivation in me. And since her sharing her achieved goals, I find that I'm doing better on some of my goals each week. Heck, the fact that I'm even setting goals each week is a big deal! I asked if I could share her story with you guys - because if I'm finding motivation, I know others will, too. Erin is a mom and a daycare provider. She is the type of woman who seeks to serve and love others. She loves to read. She would give you the shirt off her back if you needed it. She is deeply committed to her family. These are all things I really admire about her. CHECK HER OUT!!! She started making healthy choices on Sept 1. 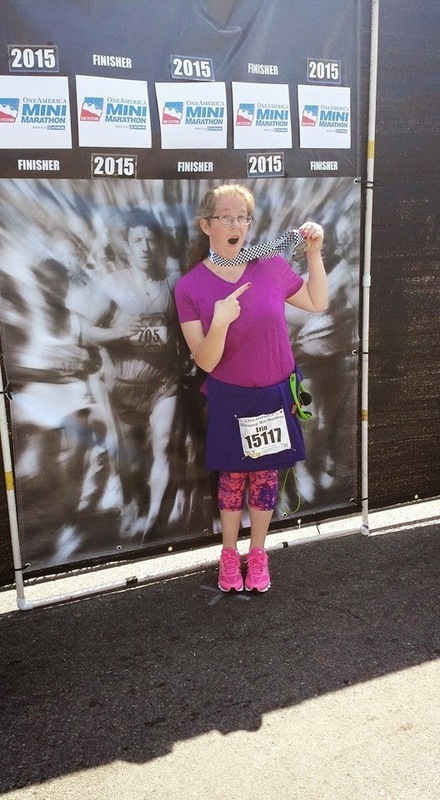 And by May - she had lost 93 pounds and accomplished an amazing goal of completing the Indianapolis Mini Marathon (13.1 miles). I asked Erin - what motivated her to start? And to keep going? "My husband actually motivated me to start. In August, he said that he was going to start running again on September 1 and watching what he ate. Would I be interested in joining him? Right away I said no to the running / exercising however I did say that I would diet and watch portion control and how I prepared meals. I really think it is easier to diet with a partner than to diet alone. About three weeks in to our diet I had a very rough day - one of those days where I just needed to step away from kids and homework and daycare and potty training. I told my husband that I was going to go on a walk around the neighborhood by myself as I just needed a bit of me time. That walk felt so good even though it only took me about 15 minutes and I was not moving at a fast pace or anything like that. The next day I told him that we would need to rework our evening routine because I would really like to start walking every evening. He was 100% on board with it and has been great about it since then. He works out on the treadmill and I prefer to be outside so we work out at the same time and he is still in the house with the boys. I get that very much needed me time and a break from being around kids almost 24/7!" I also found it interesting that Erin knew, because of her personality, that using a FitBit or other device would not be a motivator for her. She said she lost weight a few years back and basically became so competitive with herself that it became a chore to exercise instead of a joy. She does map her walks so she knows her distance and finds that to be motivating. I totally understand that - I love using Daily Mile to track my walks or bike rides. I've also tried Endomondo and Erin using Map My Walk. I also asked Erin what advice she would give to someone on this journey and her advice is exactly what I know to be true (but have struggled with lately). Get moving and stay moving. Take the stairs, park far away, go the long way to the door. Every step matters. Keep the end result in mind - living a healthier lifestyle. Being stronger. Better peace of mind. Whatever it is that you are working towards. I hope you will find Erin's story as motivating as I have! It's a holiday that I have mixed feelings about. I don't want a specific day where my kids try extra hard to be good or give me extra affection. Ideally, that would be every day. But I do like the idea of a day set aside to at least show appreciation and acknowledge the things our mothers have done and continue to do for us. Same deal for Father's Day. I also recognize that there is a world filled with brokenness out there. And that these kinds of holidays can be reminders of pain and grief and shame and mourning. Yesterday, as my kids seemed to miss that dose of Mother's Day fairy magic that makes all the children behave like perfect angels, I found myself just watching other moms. We went out to breakfast, we went out to run errands, we went to church - moms everywhere. I saw new moms, holding their babies, glowing. I remember that feeling. I remember holding Teagan on that very first Mother's Day. She was just a couple of months old at that point. I was proud of giving birth, of holding this baby, of breastfeeding, of changing diapers, of all those mom things. I had entered the Mom Club. I had found this indescribable level of love that I had never known existed. And I'm sure I glowed. Even in my exhaustion - little gestures of kindness on that first Mother's Day truly made me feel like a queen. I saw older moms. The ones who have "made it." They are being honored at a meal out. Their kids come home to visit - their adult children who now have children of their own. These moms seem to have this joy and peace that just flows from them. I'm not saying they don't have problems. But on Mother's Day, I enjoyed seeing some of those women who had their children around them, their grandkids, who could see the success of their years of hard work. And I saw moms just like me. Moms that are tired. Frustrated. Angrier than we'd like to be. Short on patience. Loving our kids. Not trading this job for anything. But we're in the trenches. We're fighting battles every day. I saw moms just like me - moms who had been told off by their daughter that morning, moms who had a son who was angry with them, moms with toddlers throwing tantrums in the restaurant, moms with a sullen teenager that they long to connect with but also feel resentment towards. In the trenches, but we make eye contact, we know we're in it together. We know the joy of the first timers and we know what is ahead of them. We long for that day in the future when we see and know that all of this hard work has helped develop real people. As moms, no matter where we are in these stages, we are connected to one another. We feel each other's pain. We know each other's struggles. We are in the trenches together. Even if my path is different than yours, my struggles are different than yours. Maybe next year, I will find a way to celebrate Mother's Day with a focus on the sisterhood of motherhood - the connection that women share. Whether we are first time moms, moms who mourn, women who long, women who struggle, moms who have made it, moms who are watching adult children struggle.... no matter the journey of motherhood, we are in it together. I had this great idea for a blog series. I was going to take some elements of faith or religion or spirituality and I was going to do a series on what each of those pieces might mean to someone who is a person of faith or who is seeking faith or even who isn't a person of faith at all. What is church? What does a pastor do? What is prayer? How do you put faith into action? Who is God anyway? I wasn't going to be an expert - quite the opposite. Those are questions that a lot of faithful Christ followers struggle with throughout their lives. I think these are also questions that non-believers have asked themselves. I started asking the questions on Facebook and there was some great discussion and insight. But as I've been reading people's responses, visiting churches, talking to people about their churches, reading articles and Bible passages and listening to some CD's (loaned to me by my Catholic brother)... I had a tiny little sliver of insight. Maybe... maybe most of it is right. Maybe we all agree more than we think we do. God is where we need Him to be, when we need Him to be there. And He calls us to meet Him where He needs us to meet Him. For some, that might mean that they experience the Holy Spirit when they are in the streets, serving and caring for the homeless. For another, it happens on Sunday morning when we gather together to worship and to learn as a congregation. God is not limited to His presence in a Catholic mass vs a Methodist liturgy vs a praise concert. Christ meets us at the Lord's Supper whether we are receiving a Sacrament or experiencing a symbolic reminder of the sacrifice that was made for us. The Holy Spirit is present in "old fashioned" organ music and hymns just as He is present in Christian rap music. Some pastors are brilliant public speakers, some are gifted at teaching, some are designed to love their congregations in actionable ways, some are called to develop leaders. Some churches are liturgical, some are free spirited, some have long and deep traditions and rituals and some are focused on introducing people to Christ in more radical ways. Some prayers are desperate cries to Jesus in a time of personal crisis while some are long and meditative times of intense prayer on issues across the globe. There are faiths that believe in a stripped down and basic worship space. There are others that believe that a worship space filled with oppulence and extravagance is a way of showing heaven on earth, of showing the glorious praise and love they have for God. Some believe in speaking in tongues, some believe in the transformation of the bread and wine, some believe in solemn hymns, some believe in shouts of praise, some believe in meditative silence. There are certainly religions that twist the word of God and the spirit of God and the love of God into something ugly and hurtful. That isn't what I'm talking about. There is part of me that thinks we need to find a church where we can serve together, grow together. And there is a part of me that wants to experience different faiths, different rituals, differents expressions. I see the Holy Spirit all around me. I believe God is in all of these different faith practices. I want to experience it. I want to go to Mass and I want to visit a Greek Orthodox church and I want to go on a silent prayer retreat and I want to learn more about different churches and why they do the things they do. I want to experience Christ in the faces of those in need. I want to know what drives the passion behind a person's religious experience. I want to know the Bible better, deeper. I want to study the books that were cut from the Bible. What is your faith experience? What is your relationship with Christ? What is your story? What are experiences that have shaped who you are and where you are?